It's been a bit challenging to blog during my ill health but I still tried. I wanted to post this blog last weekend I was not able to do so. My Kidney pains kept me in bed till recently. I am getting better though so look forward to blogging more frequently. Expo Pakistan 2013 was a four day event by TDAP (Trade Development Authority of Pakistan) that recently took place between the 26th and 29th of September. The Trade Expo is deemed to be the biggest trade show which has been showcasing Pakistan's export merchandises and services since 2005. 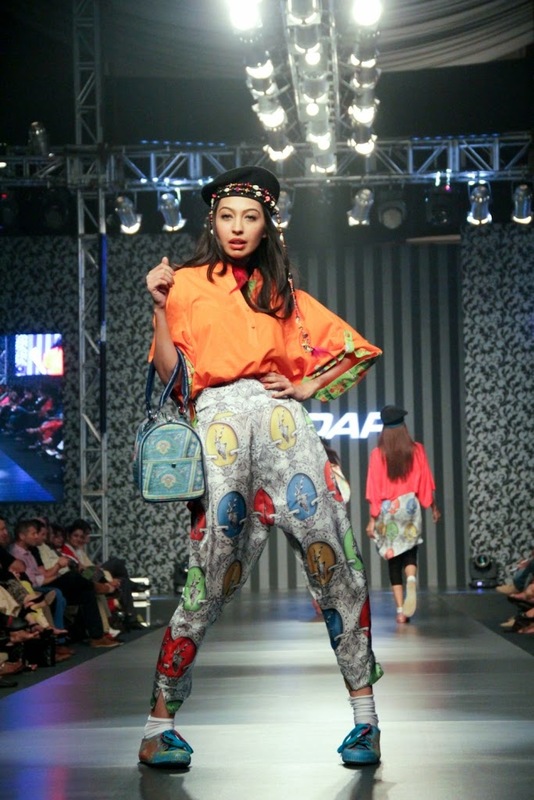 The Main Expo was, obviously, held at the Expo Center but the two day fashion showcase event was held in Pearl Continental on the 26th and 27th of September. 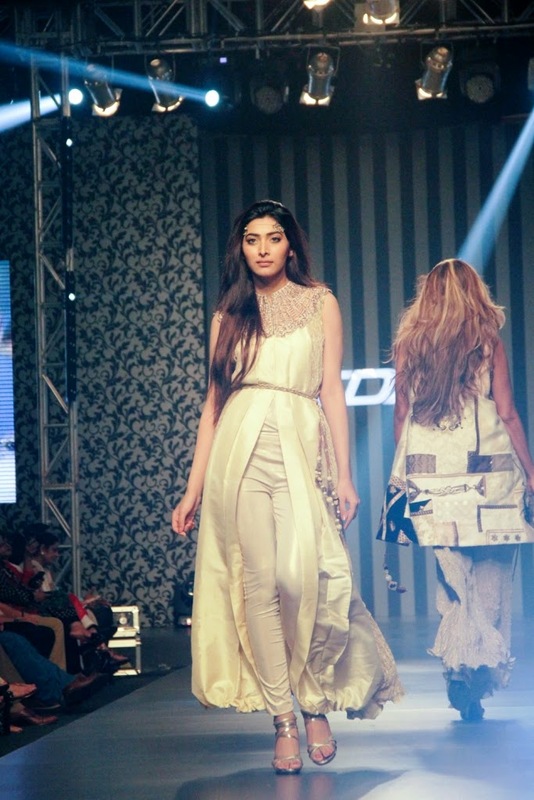 Most of the designers showcasing had already shown the collection earlier in PFDC Fashion Week and Veet Show. They added a few pieces but the concept and inspiration remained the same. I am going to review the ones I find worthy of mentioning. After being stuck for 20 minutes in traffic right outside the venue, PC (Pearl Continental), I finally landed on the red carpet. Hung out a bit with fellow bloggers, designers and social media before heading inside the marque where the TDAP day 1 Fashion show was about to begin. Settled down and looked forward to a long wait. Surprisingly it started on time (almost). 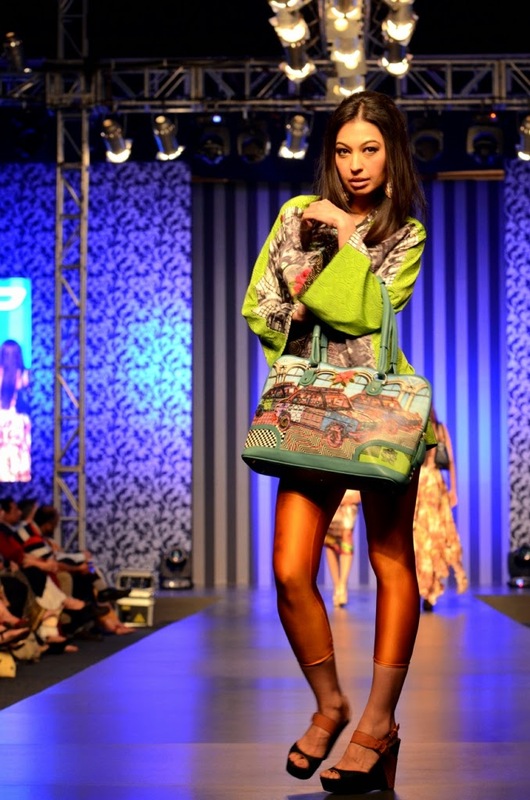 Other than the styling nothing seemed different about Rizwan's Delicious Truck art inspired collection which he had previously shown in PFDC Sunsilk Fashion Week. What can I say, we can never get bored of truck art! 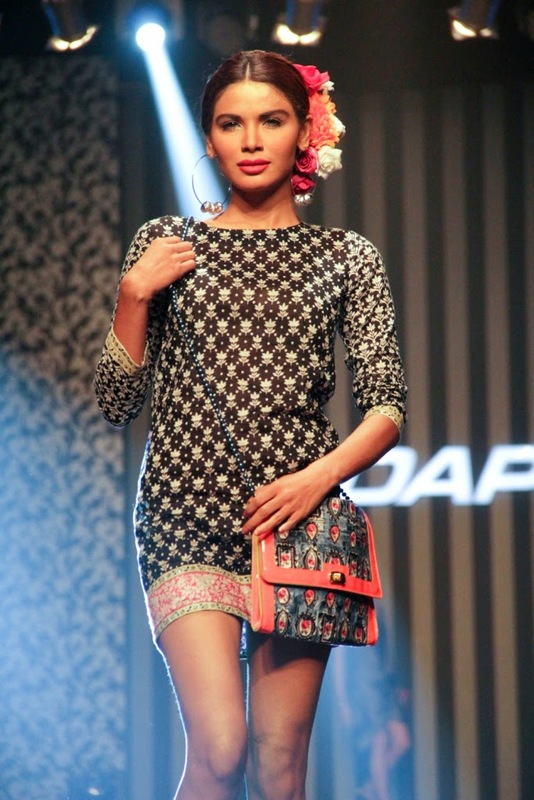 The fruity array of meticulously designed collection was a fine example of a job well. As far as translating truck art from street to high fashion, he hit the nail right on the head. 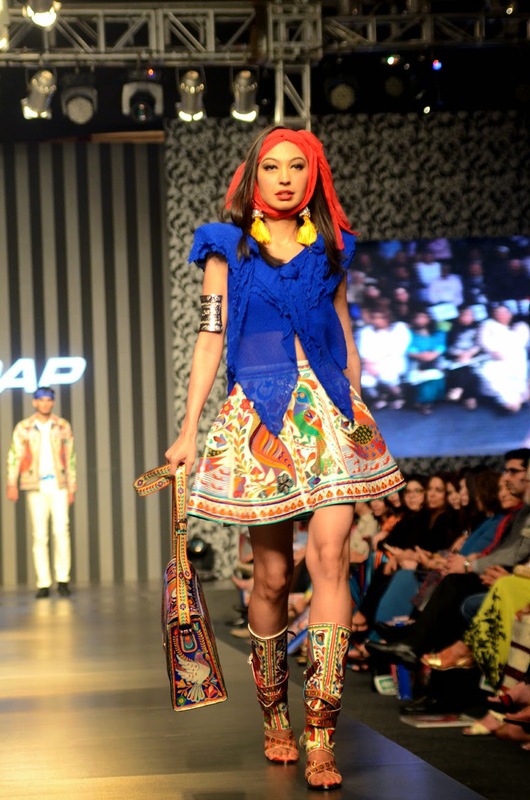 Inspired by the kaleidoscopic handicrafts of nomadic tribes who live and travel in the shadows of the Himalayas and Hindu Kush mountains bordering Pakistan. 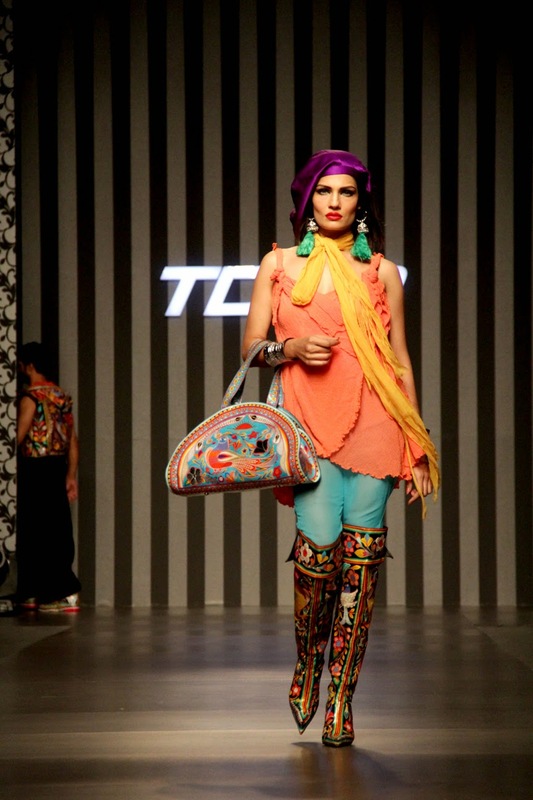 The hotch-potch of tastefully combined mosaic of prints created an eclectic masterpiece of a collection. I am so crazy about eclectic that you can't fool me by a faux pass(in terms of genre). This was definitely not Faux by far! I fell in love with some of the pieces and the rest caught my fancy too. 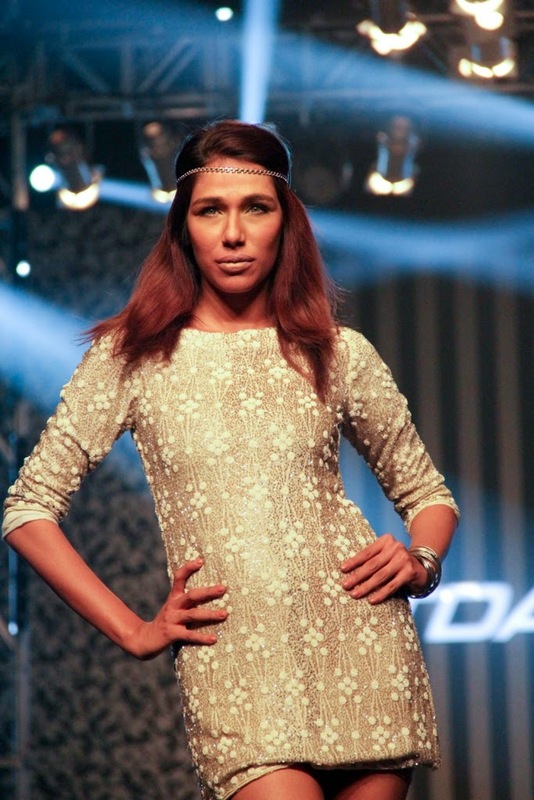 Faiza Samee's work is all about femininity, be it casual or formal. I liked how she used the Henna live, conceptually as well as a design implementation. Flowers, further distorted at places into geometric patterns, muted shades with bolder colors for balance, use of the trending camouflage, If this collection was a dish served to me I would savor it and finish it all up. 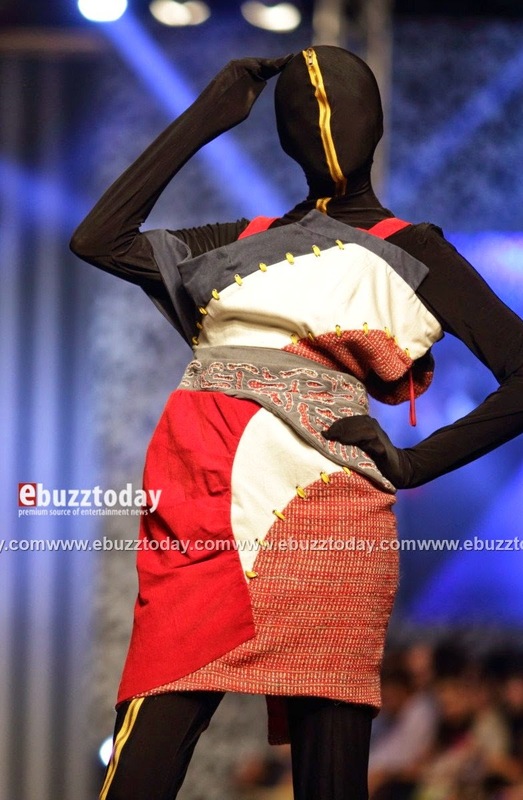 Even though Tapu's collection was yet again another re-show I must say I can never get tired of 'Karachakra'. You want to show it to me again after this? Bring it on! 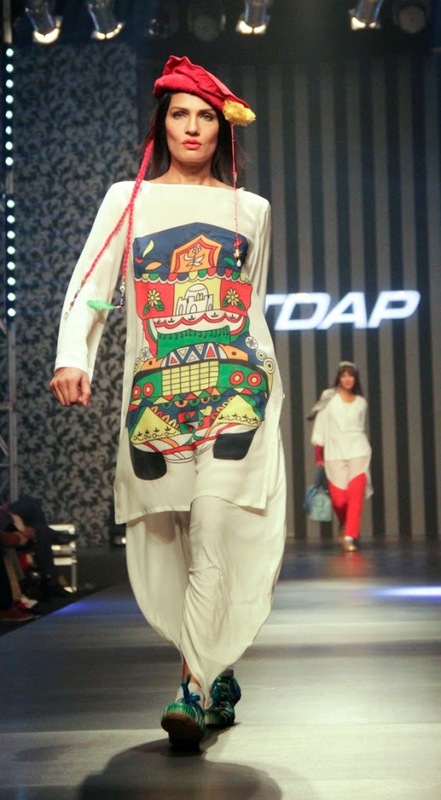 Karachi and Pakistani culture depicted through a beautifully balanced blend of art and fashion, that is how I would define Tapu's work here. Other than wanting some for myself all I heard around me was "Uff I so need that bag" and believe me not once but continuously! 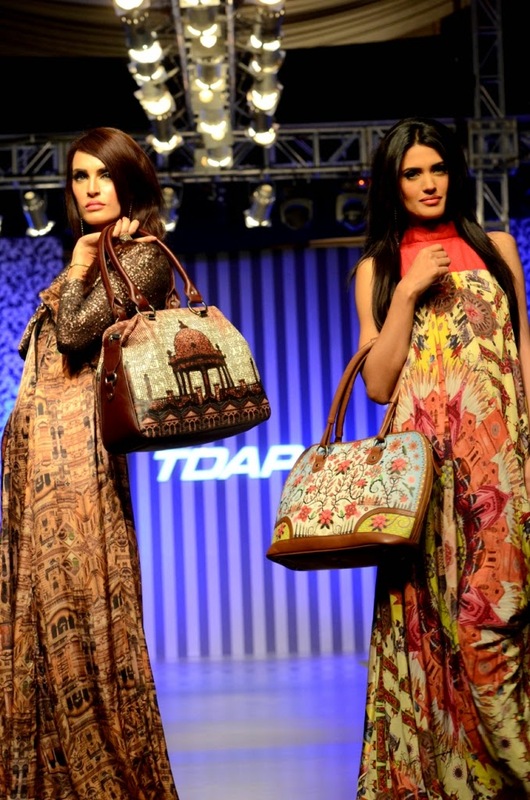 To compliment his Kaleidoscopic montage printed bags the digital silk printed flowy silhouettes did a great job as a backdrop for the masterpieces. A little birdy told me there is a good chance the backdrop will be taken more seriously soon. "Kathputli -The Mentor" by Maham Iqbal. 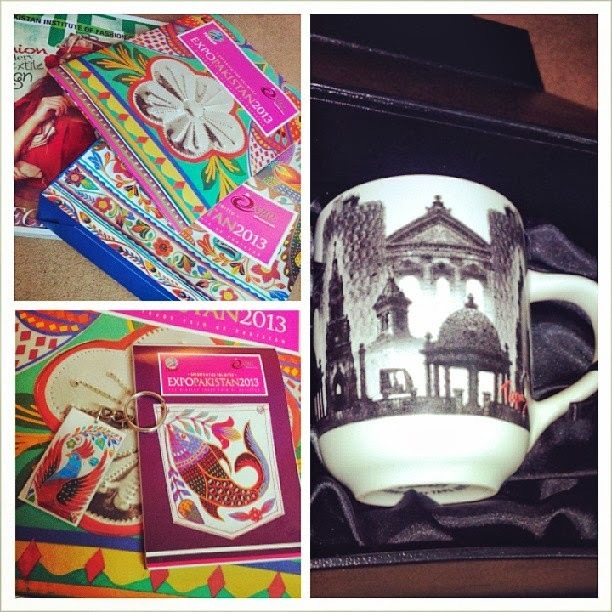 Rajasthani Art translated into these innovative accessories quite well. 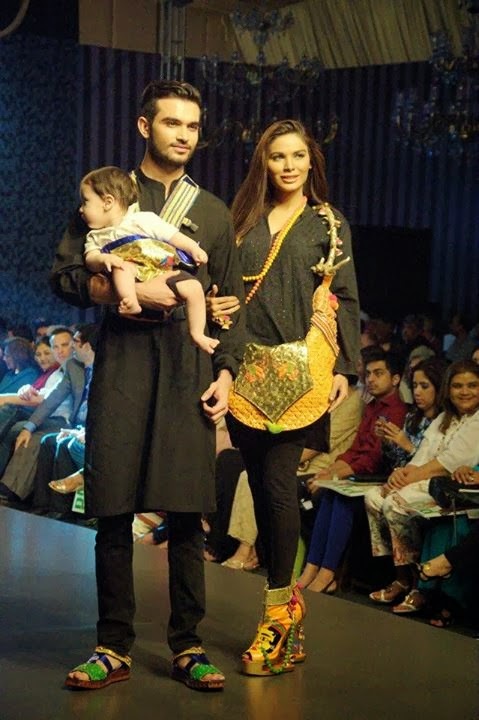 When the models stepped out on the ramp the only bewilderment that we could see was that of the child in their arms. The rest of the crowd was beaming. "I remember better when I paint" by Beenish Naveed. Highly creative and conceptual pieces inspired by a Painter, Hilgos's Journey from a marine painter to a childlike abstract painting due to Alzheimer's disease (constant memory loss). The silhouettes of this collection were derived from shapes of boats and curvilinear asymmetrical lines of Hilgo's latter work. 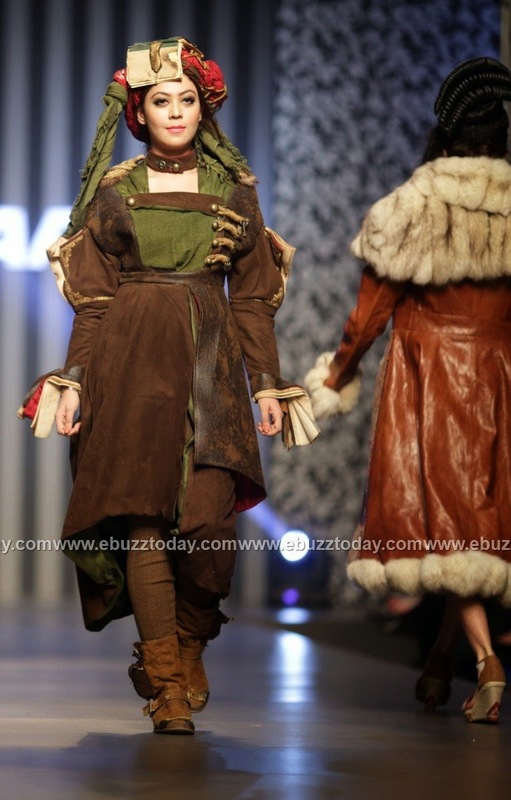 Some may frown upon this collection, I say Bravo for experimenting and concept. "The Four Corners -Road to Enlightenment" by S.Hammad Sohail Sadiq. Another mindful collection. The philosophy behind this was quite philosophical. Sorry for being cheesy but had to say that ;) Inspired by Jalaluddin Rumi (no surprise there in terms of being philosophical:p) the concept is a state of being of a soul suspended in a state of physical, intellectual and emotional chaos transitionally from one state to another. The deconstructed silhouettes and cuts translated this concept like fine poetry. It also reminded me of Barzakh. "The Game of Kings and King of Games" by Minahil afzal. This is what funky polo players look like. Period. 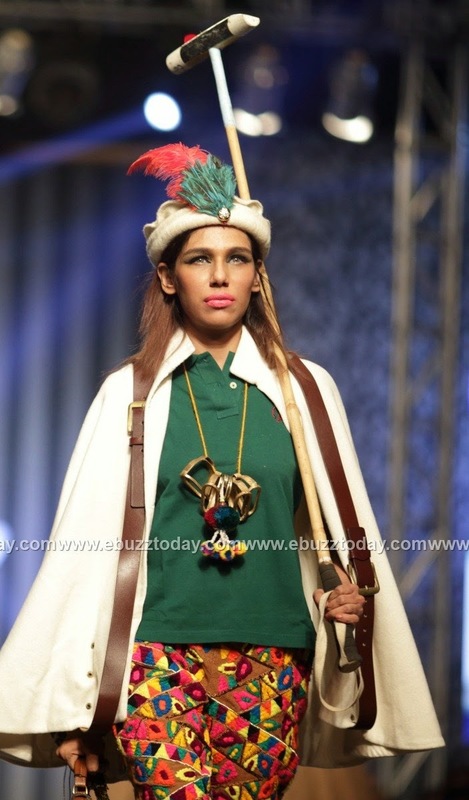 Giving an edge to the cultural Swat-ee attire and mixing it with color and polo was a super cool concept. 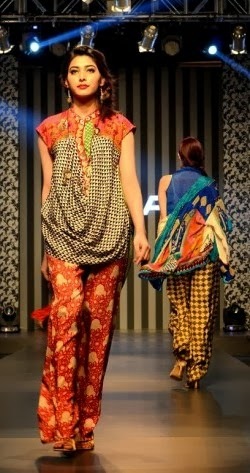 The colorful Enbroidered pants worn by Faiza was a wowzer. "Mand Nashi Dar Thoi" byRazia Hassan. 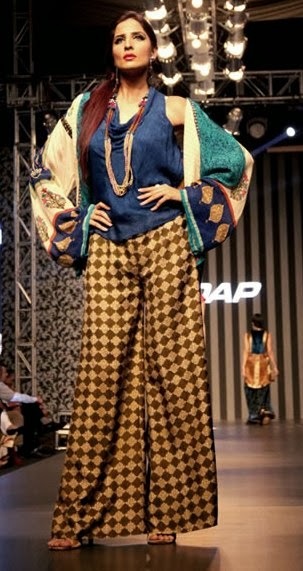 A less conceptual yet rich in culture, mixed with contemporary cuts and style. Mongol goes to Paris maybe? I Like. 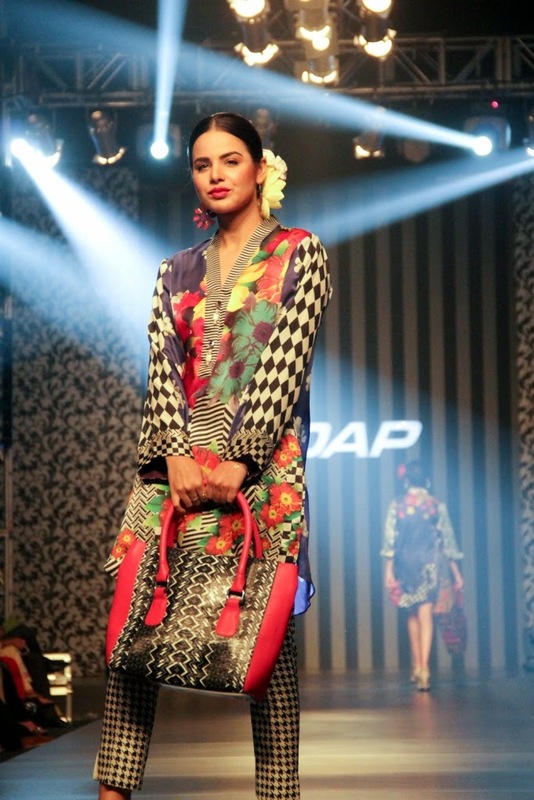 JUST by Leena Nayyar Khan. The most contemporary yet practical of the entire lot perhaps. The layering and juxtaposing of different fabric texture and shades with grungy deliberate unfinished rawness resulted in simple, stunning pieces. 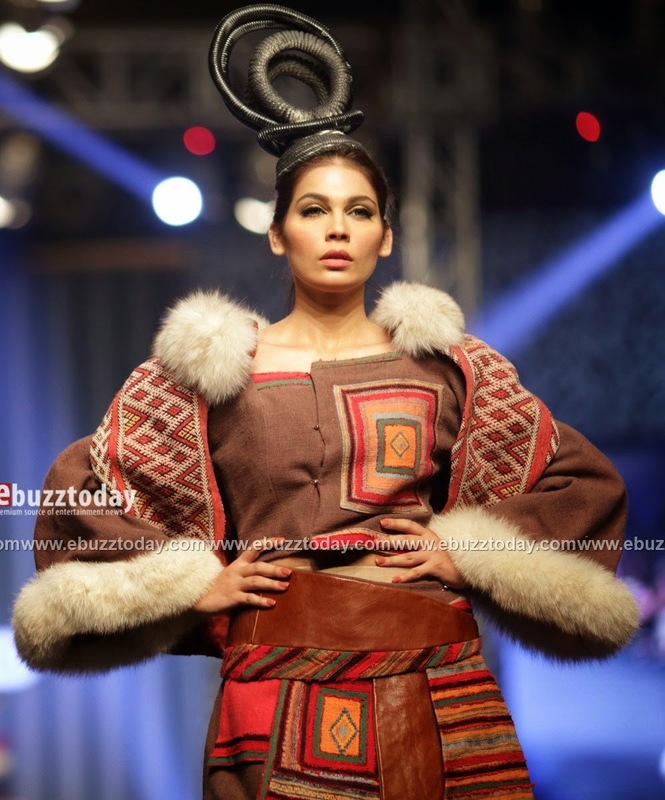 The rest of the designers that showcased on Day 1 were Zaheer Abbas, Farnaz Mustafa, Sana Safinaz, Sania Maskatiya. Even though Day 2 started later than Day 1 the collections were comparatively better. 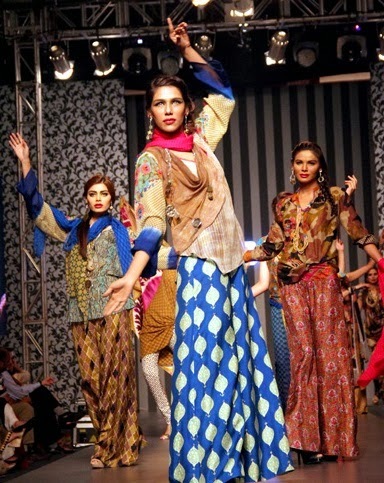 From top to bottom, this brand is a superb example of high street fashion reflecting the diversity of Karachi culture. From the old building of Bandar road to Kimari, the much loved Truck art, the hipsters burgers and bun-kebabs, it speaks for us all. 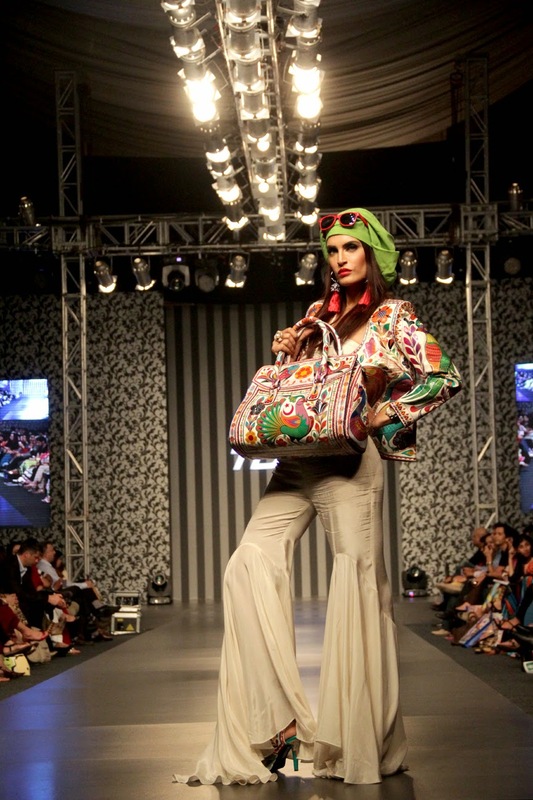 Gulabo collection rocked, literally. The berets infested with colorful flowers ans the trending funked up sneakers(the team spray painted ordinary canvas shoes themselves and they looked delish!) were a great touch to the already statement worthy clothes. A more urban chic extension of his previously sown Frieda Kahlo collection. Again amongst those who I still haven't gotten bored of yet. The Kitsch, contemporary digital prints are like ice lolly on a hot summer afternoon (in our case we don't mind Ice lollies even in October! 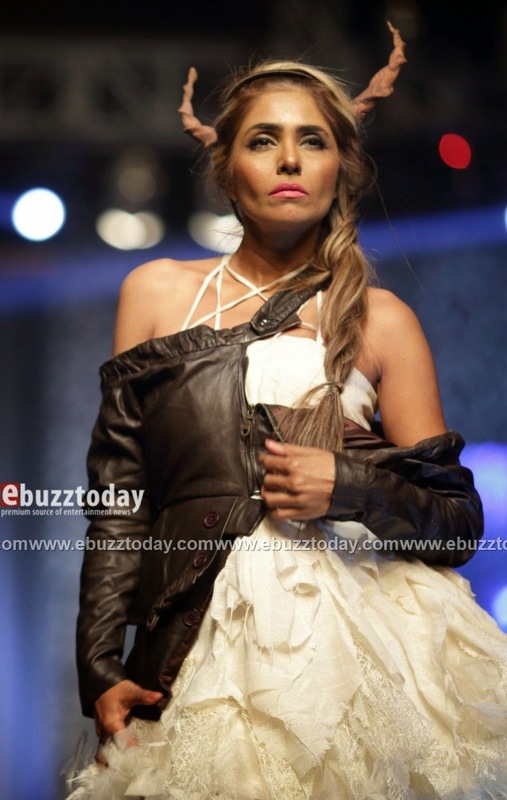 ), I completely fell in love with the top Iraj was wearing. The 'Chenaks' (metal tea pots) made my heart skip a beat. The collection definition of true elegance. It was like a subtle reminder that fall is almost here (we get autumn late in most places in most places in Pakistan and almost never in Karachi). The beautiful yet comfortable silhouettes, digital autunm-esc prints, speckles of embellishment, detailed hemline. The finishing was flawless and her pieces were the epitome of sophistication. The only thing that was out of place were the flowers used for styling. 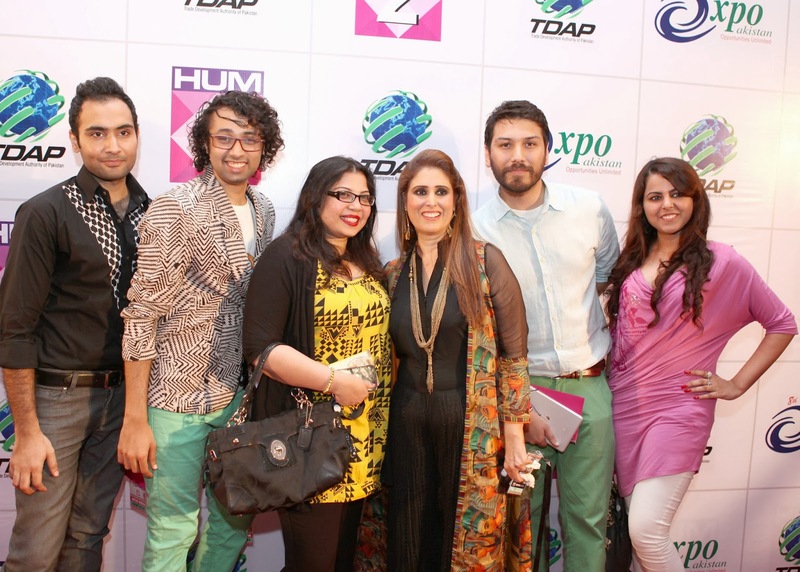 Even though Sabz is good with styling in most cases, TDAP was not one of them. The overall styling was very blah. PR and Marketing done my TAKE II was flawless and impressive. Heard so many amazing things about the event. And even your post makes me cringe for not visiting the whole thing.